Tween was diagnosed with ADHD this fall, which makes two-for-two of my kids with ADHD (one Hyperactive, the other Inattentive). For him, it was the missing piece of his health puzzle: ADHD spins his brain leading to insomnia, and enough accrued sleep debt leads to cyclic vomiting/migraines. He felt so relieved to have new information and help going forward. They say ADHD is genetic, that if a kid has it, likely a parent does, too. So I took a short online assessment. My answers indicate that I may be borderline, tipping towards yes. One of the suggestions read: “Learn to make lists, and use them.” I mentioned that to a friend who immediately retrieved a small black book from his satchel. He flipped through, showing me the chaos of his brain scrawled across pages. It excited and repulsed me at the same time. Guy gave me a journal for my birthday, one small enough to throw in a purse but big enough to be useful. I used to be a journaler but, except for travel, my journal has migrated to my computer (I type faster than I hand-write). I had a sense I needed this journal, but wasn’t sure how I would use it. How would I motivate myself to even begin to remember to use it for list-making, when I’m just not that organized (hello, the point)? I set it on a bedroom shelf where I would see it often and ponder its place in my life. Meanwhile, I heard someone speak on happiness and he reminded me of something I already knew: grateful people are happy people. Specifically, noticing three unique things for which you can be grateful each day will lead to greater happiness. A HA! My journal began to hold new promise. And I’d begun regularly using the notes app on my iPhone to keep various lists–Grocery lists; To Cook lists; To Do lists… So my journal wouldn’t need to fulfill that purpose. On January 1st, 2017, I christened my journal with the words of 2 Corinthians 5:17: “…anyone who belongs to Christ has become a new person. The old life is gone; a new life has begun!”, an entirely appropriate New Year’s verse but one to cling to all year. I tore out a page of quote cards from an issue of O Magazine and placed cards throughout to serve as inspirational bookmarks. My current bookmark says: “Every day you’re alive and someone loves you is a miracle” (Rita Mae Brown). Fitting for this miracle-seeker! On the next few pages, I wrote out Scriptures important to me and that I intend to pray for each of my guys. Last year I read Fervent by Priscilla Shirer, one of the most practical books on prayer I’ve ever read. Her point is to motivate people to pray Scripture over people and situations. That hasn’t been my MO, but by putting those verses right in the beginning of my journal, I hope it will become a pattern. 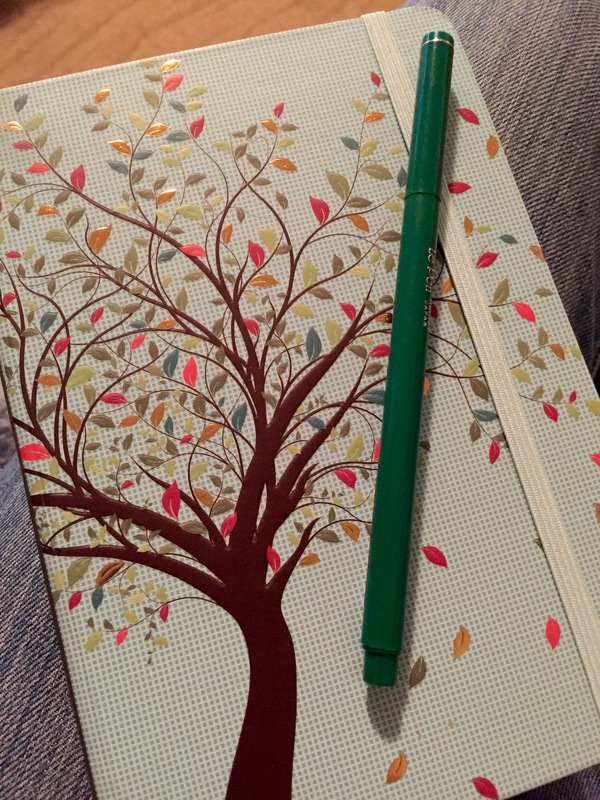 Next I wrote the date, my three gratitudes, and, working my 2017 theme word, what I re:created–in this case, the beginning of my gratitude journal! Over the next few days, I included Bible verses that stood out in my daily reading. I recorded the length of time I ran (I haven’t shelled out for a fitness tracker, but I think writing it down will help me see progress). I imagine I will eventually add reading quotes as well, and then, who knows what else? Rather than feeling like this is another necessary and dull to-do, I’m excited to be creating a record of this year in my life in all its fullness. To be honest, even though it takes only minutes, I forgot to write in my journal the last two nights. So I wrote something about “yesterday” the next morning. I try hard not to “should” on myself; developing new patterns takes time, I will make mistakes, and there ought always to be grace. Every step in the right direction moves me toward health and happiness. Which is something to be grateful for! This entry was posted in Gratitude, Uncategorized and tagged ADHD, gratitude, journal, journaling, list-making, lists, thankfulness by Milagro Mama. Bookmark the permalink.